I couldn’t have written this story any better. It’s Sunday afternoon, and our feisty Nats are facing the Philadelphia Phillies in the deciding game of a three-game set. Our ballpark is once again being overrun by a horde that came south on I-95, snapping up all the empty seats that our local fans do not fill. This breed of Phillies fan, I’ve heard, is louder, drunker, and more obnoxious than the usual patrons of Citizens Bank Park, who patiently waited many years for the winning team they enjoy now. Our guest fans apparently can’t get tickets to their own home games, so they must grab other opportunities to make themselves seen and heard. The Nationals are mostly about the future. That team to the north, which went through a prolonged rebuilding process ten years ago, is their model. But sometimes, just sometimes, the Nats are about the present. They had won Friday night’s game with a fabulous walk-off grand slam by main star Ryan Zimmerman, only to drop Saturday night’s game. So they are primed to take the series, but so are the Phillies hordes. In the ninth inning, the Nationals are trailing 4-3 and down to their last strike. The Phillies reliever is dealing, having struck out the first two batters. He has the talented but erratic young shortstop, Ian Desmond, on the ropes. Everyone in the ballpark knows that Desmond will strike out to end the game and the series. He strikes out a lot, and is particularly susceptible to sliders, this pitcher’s specialty. So the Phillies fans are already on their feet, yelling for the inevitable victory and shouting down any Nationals fans who dare to hope. It simply couldn’t end any other way. Except, it does. Somehow that next slider stays up, and Desmond knocks it out of the park. 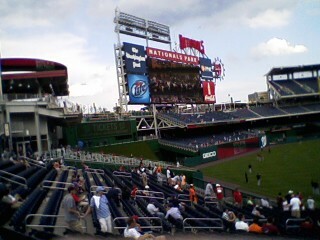 It’s a 4-4 tie, and the outnumbered Nationals fans invite the Phillies fans to sit back down, since it ain’t over yet. The story line gets even more improbable in extra innings. In their half of the tenth, the Nats load the bases, assisted by the ex-Phillie Jayson Werth, who momentarily silences the boos he’s been hearing in his new home ballpark. Coming up with one out is a tattooed comedian named Jonny Gomes who has hit into his share of double plays. Only this time, he drives in the winning run by somehow allowing himself to be hit by a pitch. He rubs his elbow and glares at the crestfallen pitcher with all the false outrage he can muster. Who cares how it happened? For once, the irritating villains have to make the long trek home with their tails between their legs – and true life turns out sweeter than any fictional twist I could have invented. I must have really made it, now that I’m getting one-star reviews! They are from “reviewers” who profess themselves too bored or unimpressed to finish reading my books. From the sound of it, the poor dears had to struggle to get through the first few chapters. One reader declared it a “waist” of time. Another managed to at least skim the book, enough to offer a non-comprehending, out-of-context opinion about one episode. Offering the books free seems to invite this kind of trashing. It’s assumed the author didn’t value her own work enough to set a price on it. That really isn’t the reason, at least not for me. I write for the love of it and to attract readers, not to make money. Even a very bad review can be fair, but there is no chance of fairness if there is no attempt to at least grasp what the author is doing. The stories have a beginning, middle, and end, all of which need to be a part of any honest evaluation. So do us all a favor, one-star reviewers. If finishing the book is too much for you, just put it down. Forget about it, delete it, throw it in the trash, or resell it. Just don’t feel obligated to comment.